This year my husband and I selected our 42nd Christmas Tree. 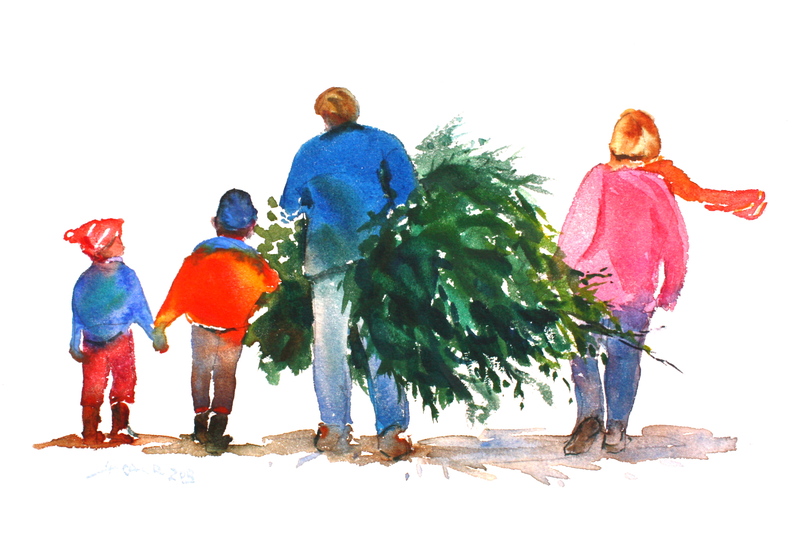 When the children were young we packed them all into the old truck and went tree hunting. In Mississippi, we have beautiful hardwoods and loads of pine trees but our evergreens for Christmas trees are usually a Cedar Tree, and they grow wild. My husband grew up on a farm and his family property is filled with these trees and so we always drove out to the farm in his old pickup truck to cut our tree. We knew where the droves of trees would be, but it was a walk to get there Once we all managed in and around cow patties, mud holes and sticky bushes we were there. Cedar trees have needle like leaves that are very soft that fan out to make the limb appear to be somewhat flat. They smell divine! As a small child we had nothing but cedar trees for our Christmas Tree, my mother was known to leave the tree up so long that we decorated it in January for New Years, in February with hearts, and March with shamrocks, really. Our first house was a small house with 8 foot ceilings and even small trees would look huge in the room, but when we built our home where we still live, we did not consider how large a tree it would take to fill the front cathedral window. There was not a tree big enough to fill the space but we still tried. Each year seemed to have its own tree story from decorating nightmares to early dead tree syndrome and here are a few stories to make your own catastrophes not so bad. The year of the fall – Our first (and last) really large Christmas tree was over 12 feet tall and it did fill the window. The tree stand, however was not quite up to standard, during the night after laboring over the correct way to string lights inside and out and hanging all the precious ornaments from Christmas’ past, the tree crashed to the floor waking everyone in the house, it looked like a beached whale lying on its side all across the floor. We waited until the next day to survey the damage, put it back up again and as we turned around it came crashing down again. Finally my husband tied the tree to the wall and it stayed put. The year of the cat. My daughter had a need to help needy cats and always had a few hanging around her apartment. She brought one such needy cat home with her one Christmas. Explaining to us that Chloe’ was a “special” cat with “special” needs was an understatement, Chloe” was nuts and wild. Chloe decided one night as we sat by the fire to run up to the top of the Christmas tree and once there had a case of diarrhea. Chloe hung onto the top of the tree for dear life and the more we tried to get her out, the more diarrhea she had. Needless to say we threw that whole tree away, lights and all. The year of the electrical fire, do I need to say more? We used old fashioned big color bulb lights – yes, the tacky kind, the larger the glow the better, along with reflectors that are used to create even more glow, but the two together get hot, real hot, and are not intended to be left on all day and night. Luckily I was home when I began to smell something burning, the electrical cord was smoking and the branches it covered were starting to sparkle in a most unfamiliar way. FIRE! I forgot to unplug the tree before I threw a bucket of water all over it. Just a little charred tree. The year I fell off the top of the 8 foot ladder. It was not a graceful fall either. The year of the dying tree. We cut down a different kind of tree that year, first thing after Thanksgiving, which is early for us, brought it home let it sit in the bucket and soak for a week, brought it in, decorated it and one day the needles were everywhere except on the tree. Dead as a doornail. We shook it good let the rest of the needles fall, vacuumed it up and left the tree standing, our own version of the Charlie Brown Christmas Tree. MERRY CHRISTMAS YA’LL!! from our Tree to Yours. 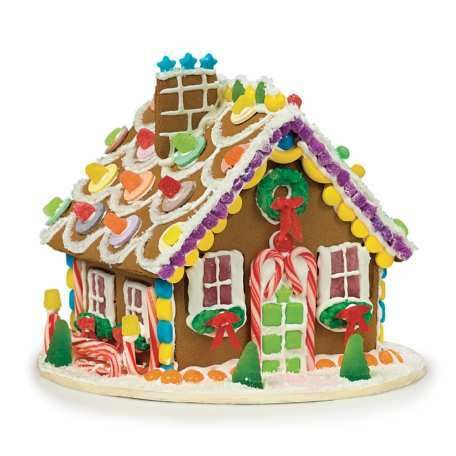 The problem with being an artist is that if I am not painting I am always creating ways to be creative and that usually leads me into areas of the unknown art mania, such as Gingerbread House making. Did I say I have 9 grandchildren, 5 of which are under the age of 6 and we are having a Gingerbread House decorating party. Any sensible person would think that having 5 children under the age of 6 over to decorate Gingerbread Houses (yes plural, as in more than one house) would be a stretch. No, not me, the more the merrier, as a matter of fact, there will be 10 children under the age of 6 over , with a parent of course, to decorate houses, which I will have assembled and ready to decorate. I have been up all night in my mind preparing for the day and the mess to come with excited anticipation because, its what I love, and because I’m such a bossy cow, I get to be the Indian Chief in charge. First things first, I make my Gingerbread House as an example of what a real, glorious gingerbread house is supposed to look like and every one can oooh and ahhh and I can say, “oh it was nothing, thankyouverymuch” when it will probably take me most of a whole day to create, which is why I’m all over the internet looking at all the possibilities for the most awesome gingerbread house ideas. What I find is that the candy part is really important. Its got to be flashy candy, the kind with pazazzzz! I will go to the local candy bins and sift through some soulful sweets today. I just happened to pack up my old fashioned cooker cutters for some sugar cookies to decorate the grounds for the House, and every house must have critters. Did I mention that I will be putting together 6 houses? Makiing 3 containers of Royal Icing, setting up for 5 families to work and being the Indian( bossy cow )Chief? All of this because I am not painting … photos of said project to follow. Wish me luck! It was the first time I cried at the very opening of a movie, I was watching for the first time “On Golden Pond”. The opening scene began with a golden sunset on a beautiful pond and a background piano and orchestra with loons and I was so captivated and sobbing with the beauty of an image captured by music. Today, there is not a piece of music that I love as much. If I could paint one painting that could evoke the same feeling, it would be my masterpiece. I have since been more aware of the musical scores that accompany big screen productions. I find that Original Scores have become a major player in my music files and when looking for music to paint by, I seem to always choose my Soundtracks, they give me the passion I need to concentrate and bring on an emotion that adds to the act of painting. The End Title (From “Driving Miss Daisy”) composer Hans Zimmer – His work is awesome. “Mercedes Lullaby”,”Pan’s Labyrinth Lullaby” by Javier Navarrete, intriguing art film! “Love Theme” by Ennio Morricone, a masterpiece from the best ever movie Cinama Paradiso on top of my Movie list. “Twilight and Shadow” by Howard Hore with Renee Fleming from The Lord of the Rings of which I am a HUGE fan. Shine soundtrack, August Rush, Fistul of Dollars (oh yeah, Clint Eastwood), Ladies in Lavender and a Japanese favorite film called Departures. There are pieces not described, because for some reason I need sleep, that are worth hearing. PLEASE SHARE!!! thankyaverymuch. Now, GO FORTH and LISTEN!